Even the most avid readers of the Gospels cannot quite imagine the dramatic change of mood in Jesus’ disciples from the afternoon of Good Friday till Easter morning. They had invested three years, three hard, intensive, exhilarating years with the one they believed would deliver Israel from its oppressors. Yet he did not sound like a revolutionary who could overthrow the Romans. He was more interested in attacking hypocrites and reaching out to lowlife outcasts. Nevertheless, he sounded very convincing. The crowds were astonished at his teaching, for he had much more authority than did their regular teachers. And he could heal any disease, even raise up the dead. He made astonishing declarations about himself: ‘Before Abraham was, I am,’ he told a hostile Hebrew crowd, who well understood the implications of calling himself ‘I am.’ The disciples believed him, despite their moments of unbelief. But now all seemed lost. Jesus was betrayed, tortured and put to death on a Roman gallows. And yet… a strange turn of events had occurred. Mary Magdalene had come to honour the tomb early Sunday morning and found the very large boulder blocking the entrance removed. Jesus’ body was no longer there. She ran to tell Peter and John. They ran to the tomb. The biblical text tells us John outran Peter. Could it be? Could it be that all Jesus had said about being raised up the third day was somehow true? We don’t know all that was going on inside their minds. But the brilliant Swiss realist Eugène Burnand well captures their emotional state. Like children running to greet their beloved father home after a long trip or to discover the present they never imagined anyone would give them, John and Peter run to the tomb to verify what Mary had reported. John, wearing white, symbol of purity, clasps his hands like a football fan hoping against hope that his team will stay ahead to the end. Peter, somewhat older, his face wizened from numerous fishing trips, holds his hands to his chest – is it true? Am I about to see the one I so dearly love even though I denied him under pressure? The genius of this painting is as much in what we don’t see as in what we do see. Though John and Peter are gazing ahead, we must imagine what they behold by seeing through their eyes. Is this not the essence of faith? We know it is true, we know Jesus rose, but we have not actually seen him as yet. Burnand was maligned during his life for resisting Modernism. Whereas painters like Gauguin and Van Gogh guided the viewer behind the visible into another reality, Burnand painted reality as he saw it. No icons here (well, almost none). He loved the Swiss countryside and often painted glorious pictures of the natural beauties of his beloved country. He also painted historical scenes, such as Flight of Charles the Bold, which presages moving pictures with its photographic realism. Today, however, we recognize that there is much more to his work than naturalism. Particularly in his depictions of biblical scenes we are drawn into the dramatic and emotional intensity of events. In his Return of the Prodigal Son Burnand pictures himself not as the son but the father. We sense something of the father’s emotions through his far-flung arms. Though of a very different era we are reminded of Rembrandt’s Return of the Prodigal Son (1669) with the father’s loving embrace of his son and compassionate, sorrowful joy. Burnand’s Peter and John Running to the Tomb invites us to believe, not with the complacency of merely subscribing to theological statements, but with the faith that says ‘I believe, help my unbelief,’ the faith that runs toward its object, the faith that sings with J.S. Bach’s Easter Oratorio: Kommt, eilet und laufet – come, hurry and run! 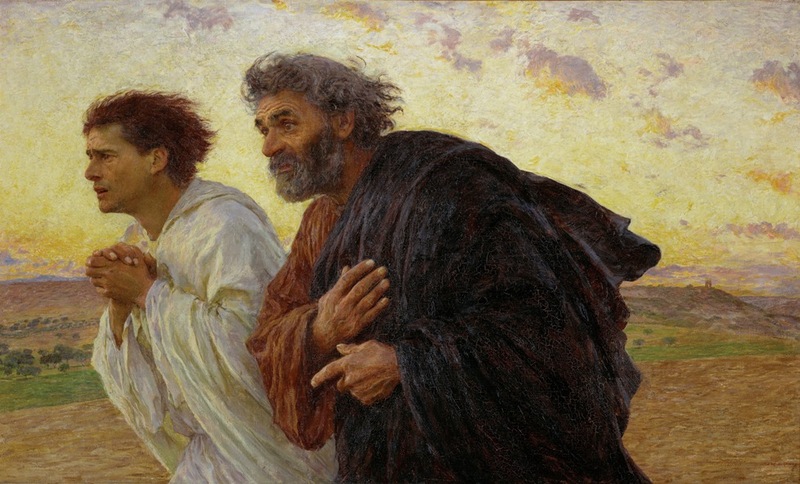 Eugène Burnand: Peter and John Running towards the Grave, 1898, oil on canvas, 83 x 135 cm, Musée d’Orsay, Paris. Eugène Burnand (1850-1921)was born on August 30, 1850 in Moudon, Canton de Vaud, Switzerland. He studied painting at l'Ecole des Beaux-Arts in Geneva with Barthélémy Menn, a realist master. In 1872 he moved to Paris to join the studio of landscape painter Jean-Léon Gérôme. Though known as a realist and drawn to the new art of photography, his paintings were far more than naturalist reproductions of people and scenes. A major influence was Jean-Francois Millet, who painted simple people in postures of prayer or gleaning the fields as in biblical times. Interestingly Millet had a great influence on Van Gogh, who often wrote about him in his diaries. Burnand is often compared and contrasted with Ferdinand Hodler, the realist artist from Berne, Switzerland, who was equally religious, but decidedly more expressionistic than Burnand, whose background was Calvinist. Burnand thought the emerging positivist philosophy of his day could provide him a greater sense of immediacy. There was considerable demand for large-scale religious paintings at the turn of the century, with America providing a solid market. After a good fifty years of a productive life Burnand died on 4 February 1921 in Paris, a little over 70 years old. William Edgar (Honors Music B.A., Harvard University; MDiv, Westminster Theological Seminary; DTh, Université de Genève; D.D. Faculté Jean Calvin, Aix-en-Provence) is Professor of Apologetics at Westminster Theological Seminary, Philadelphia, USA, where he has taught for over twenty years. He is ordained in the Presbyterian Church in America. He directs the gospel-jazz band Renewal. Edgar is currently Professeur Associé at the Faculté Jean Calvin, Aix-en-Provence, France. Edgar’s scholarly interests include apologetics, theology, aesthetics, African-American music, and ethics. He belongs to several learned societies, including the American Musicological Society and the Society for Ethnomusicology. His wife, Barbara, and he have two children and three grand children.